Sew what's cooking with Joan! : Paccheri pistachios, dried tomatoes & ricotta ... Cibo Squisito! 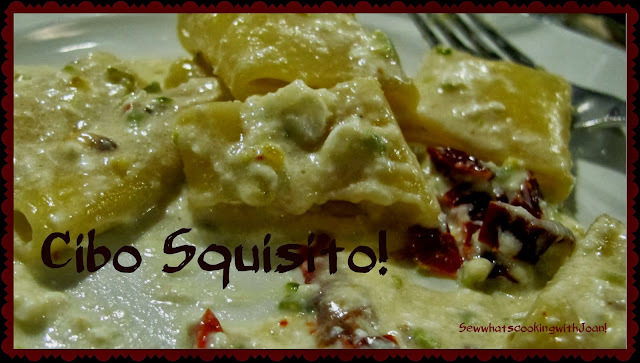 Paccheri pistachios, dried tomatoes & ricotta ... Cibo Squisito! Paccheri are very large tubes. In fact, they are so large that they collapse when cooked, trapping inside them whatever they have been sauced with. The name means "slaps", because they supposedly make a noise like slaps, when lifted by a fork. You'll hear the "slap" in the following recipe! There's paccheri with a sauce of cherry tomatoes, shrimp and monkfish from a restaurant called Da Gemma, which faces the cathedral in Amalfi, and there's also a dish created by a accomplished chef, a man Neapolitan's would call a Monzu, where the paccheri are sauced with an incredibly rich tomato sauce enriched with butter and whipped cream. I would love to serve my guests paccheri with this sauce, garnished with lobster or crab as it is rich a would be delicious! The recipe I am offering today came from our visit to Rome. I created this recipe because of a dish I had at Taverna Rossini Restaurante in Rome. We stayed at the Parco di Principi hotel in Rome, the Taverna Rossini is located a few blocks away. Also nearby, is the Hilton Garden Claridge. 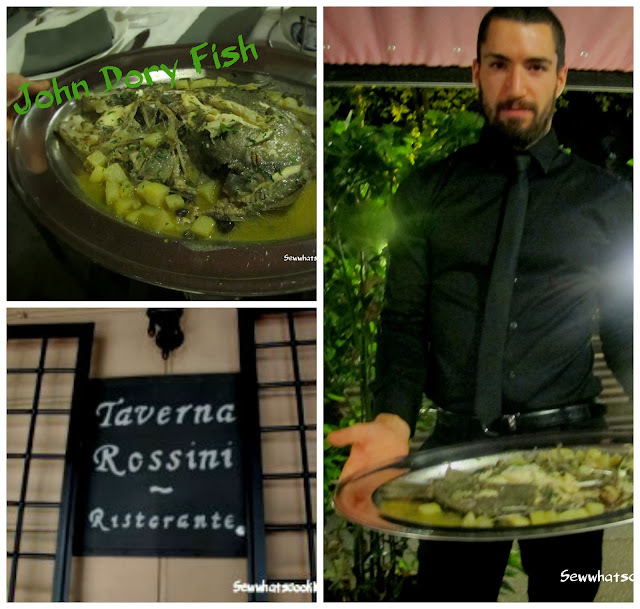 The first dinner we had was next door to Taverna Rossini, at Pescheria Rossini, same owner, but is mainly fish and more elegant, a bit pricier, however, either restaurant you can have both menu's! Both are excellent with lovely outdoor dining and excellent service. Wee Bear and I had John Dory at Pescheria, cooked to perfection. We had lunch and dinner at Taverna, same menu for lunch and dinner (which is extensive). 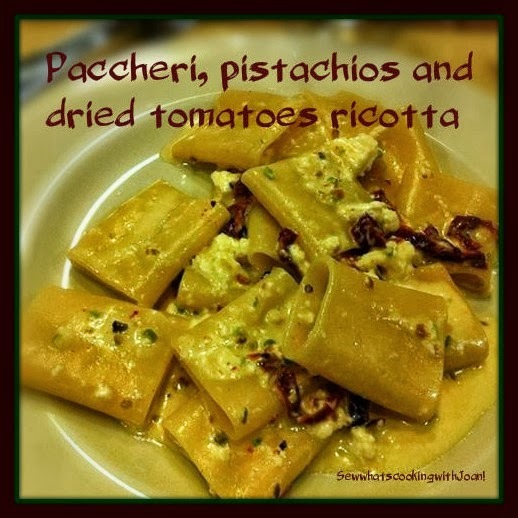 The Paccheri, pistachios with dried tomatoes was at both meals, lunch and dinner!! I ordered for lunch while Wee Bear went with his old stand by, pasta Carbonara. Both were great but, when Wee Bear took a fork full of mine, he was slapped! Slapped with the deliciousness of this dish and boy did he hear it! Of course, we had to go back, as Wee Bear wanted the wood fired pizza, the Paccheri and his favorite Veal marsala. I threw in some roasted vegetables, our waiter threw in some fabulous wood fired bread with fresh olive oil and I thought they were going to have to roll us out in a trolley! I highly recommend this restaurant for your next visit to Rome! It is on our list, to go back! Prepare the tomato sauce. Or reheat. Keep it hot, but not simmering. Put the pasta water to boil. In a pasta serving bowl, combine the ricotta and the grated cheese. Work them together with a spoon or fork until well blended. Serve immediately, preferably in hot bowls. Pass grated cheese! Pour the wine! Cibo Squisito!! ~Note - this can be made with other types of pasta that you have on hand, rigatoni is a great substitute! I brought back my paccheri from Naples, bulky as they are to carry in a suitcase, Wee Bear did not complain. However, they are not so difficult to find, although you certainly won't find them in an everyday supermarket. The Setaro brand, can be found from a truly great Italian store called Buon Italia, which is in the Chelsea Market on Ninth Ave. and 15th St. in Manhatten. Paccheri is also available by mail-order, too. A.G. Ferrari Foods of San Francisco (and other store locations in the Bay area) carries a good Neapolitan brand of paccheri made in Gragnano, a town on the Bay of Naples, near Sorrento, that is famous for pasta production. And of course just about everything can be found on Amazon!! 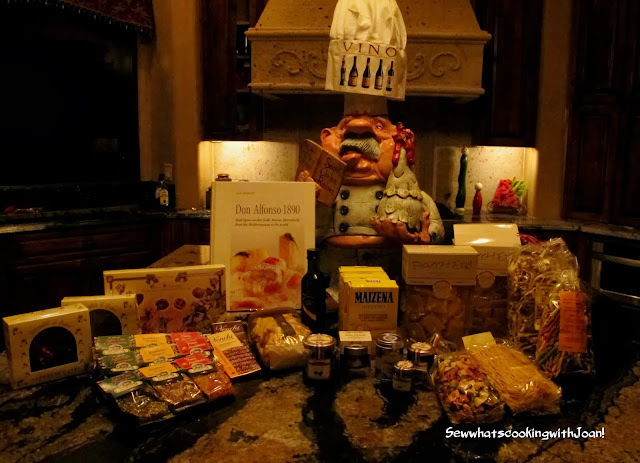 This is the food portion of what I brought back from our trip to Europe! Not one complaint from Wee Bear! I think he is learning, these purchases will definitely make him a happy Bear!! (Paccheri in the large boxes on the right, also note everything is in good shape) Lot's of white and black truffle products, as this is my weakness! I never forget sweet gifts for my 93 year old Mother and savory for my gourmet cooking children! 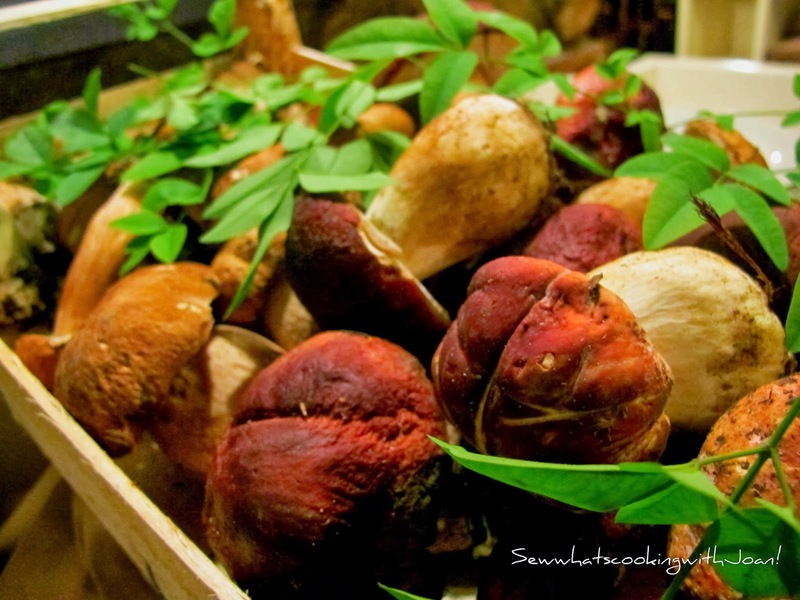 Nothing speaks Fall more than delicious mushrooms! How about this on my kitchen island? Bella alimentare! We are off to Ohio this morning for the Beta reunion at Ohio U. Wee Bear and I with other Beta's are playing golf at the famous Muirfield golf course, where the President's cup was just played and another course our host has arranged on Friday! Saturday it's "Go Bobcats"! I'll be wearing my green and white at the football game, with parties going continuously for four days! I will not post another blog until Monday, however, check out the construction going on under "RECIPES"! 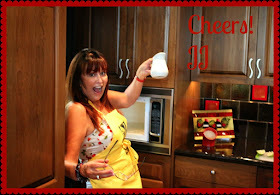 I am making it easier for you to find the recipe you are looking for!! It is still under construction, but, I promise you it will be fantastico! I just met you last night and had heard about your blog from Pat. I am thrilled to join your followers, this is the most informational blog I have read. I love the changes you are making on the Master Recipe page. The Fall recipes all look fantastic! I might suggest a seasonal section? You are a delight and we already think of you as a Bobcat!